It can be hard to achieve the right texture when blending pasta for residents on texture modified diets. Adding the cheese sauce in the mix when pureeing helps achieve the suitable meal consistency. In a large pan sauté onion in oil with beef mince. Add KNORR Pronto Napoli and simmer for 1/2 hour. Remove from heat, cool slightly then puree mince mixture in a blender. Place in individual pie dishes and refrigerate for 6 hours. Cook macaroni in boiling water and drain. Allow pasta to steam off on a large tray. Bring milk to the boil and whisk in KNORR Roux until thickened. Add 250g grated cheese and cooked macaroni. Remove from heat, cool slightly then puree. Spoon pureed macaroni over set mince. 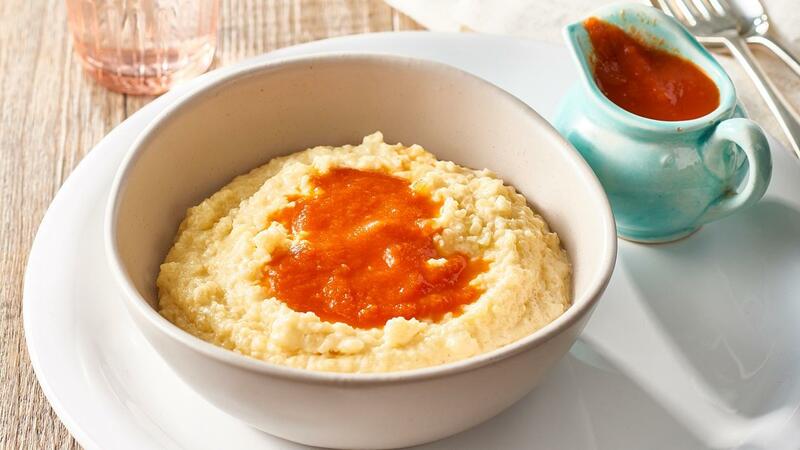 Serve on a bed of pureed KNORR Pronto Napoli. Puree the pasta with the sauce to give it a smooth texture.